Soft, light and buttery Pistachio Bundt Cake flavored with real pistachios and almond extract. 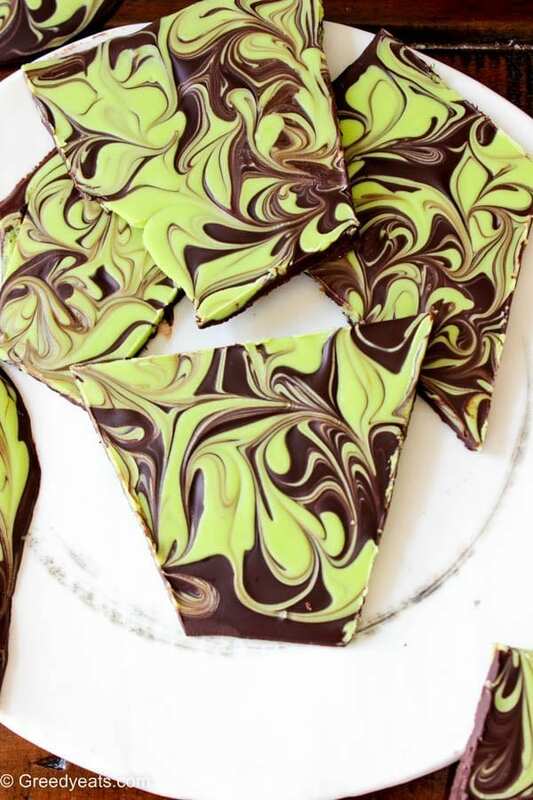 Finished off with fun and festive green candy melts topping! 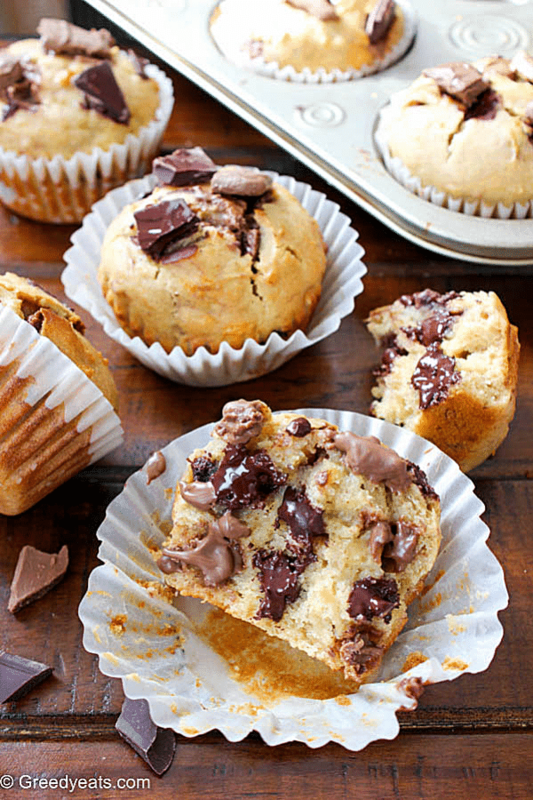 Healthy banana muffin recipe for your busy mornings, lazy afternoons or crazy evenings. Come on! They are your banana muffins. Have them any time you want! 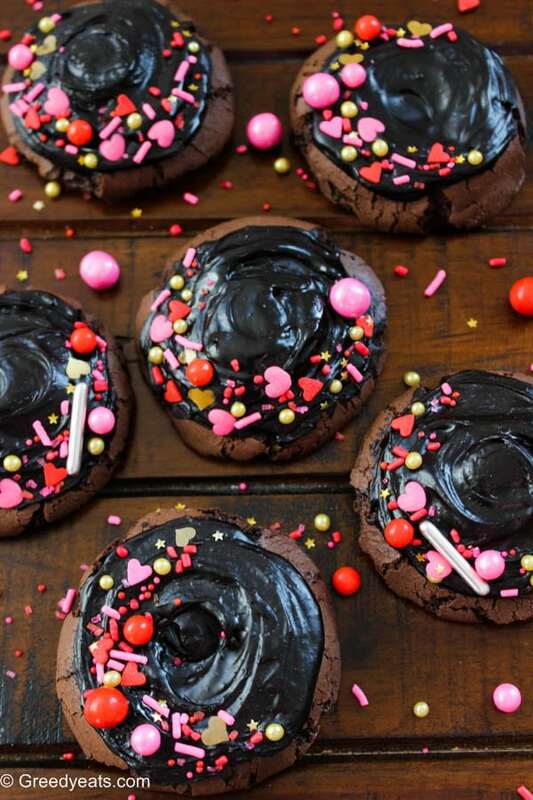 I can’t stop staring at those gooey and melty dark chocolate pockets. 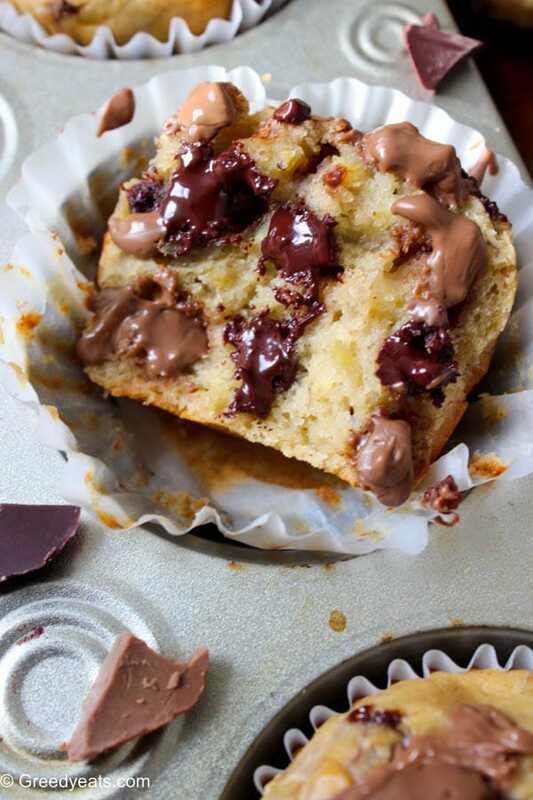 Because they did not solidify (like the milk chocolate) as soon as I cut my muffin into two. As a result, I’m even more certain that I don’t like milk chocolate. I never have! Added it only for more calories looks. Sad face! However milk chocolate or no milk chocolate! This is totally upto you. Because they are a winner with or without any chocolate. 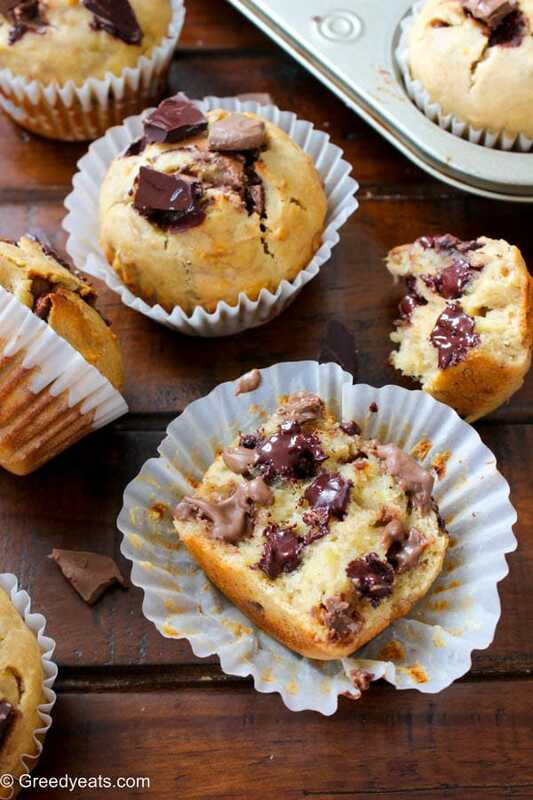 So these are all stuff healthy banana muffins? Huh! Probably they taste like some boring health food then? Nope! Rather they taste exactly like a soft, tender and fluffy banana muffin overloaded with fat and white sugar. 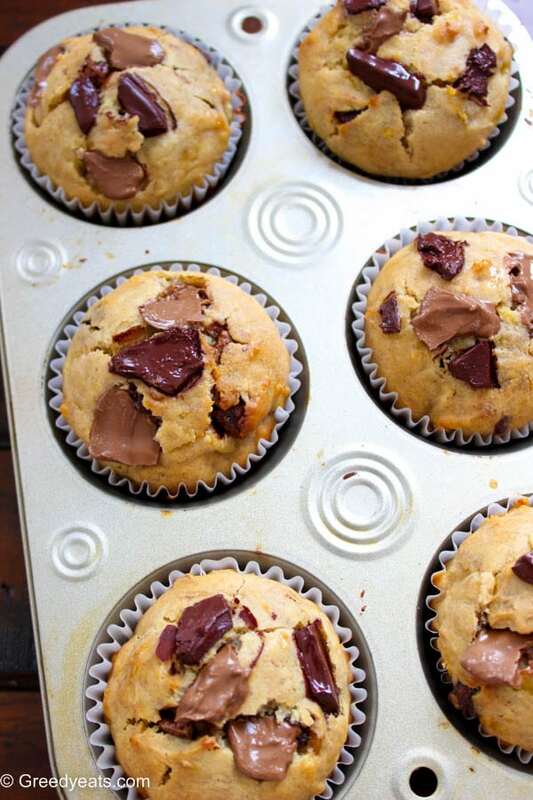 How to make healthy banana muffin recipe? So easy! Firstly, start with mixing your eggs, honey, greek yogurt, mashed banana and some almond/soy milk. Secondly, sift your dry ingredients over the wet ones. Now I have used a combination of white whole wheat flour and all purpose flour. Certainly you can use whole wheat flour in addition with all purpose flour or even all white wheat flour . 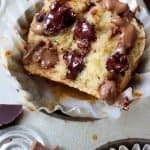 Finally add your chocolate chunks, pour them in the muffin tray, top with more chocolate, bake and top with even more chocolate! Seems like you get my point! That’s the way I did it. And see the result. ⇓⇓⇓ Certainly charming! Charming right? Most importantly, don’t forget to grease your liners/muffin tray well with a spray or some oil. 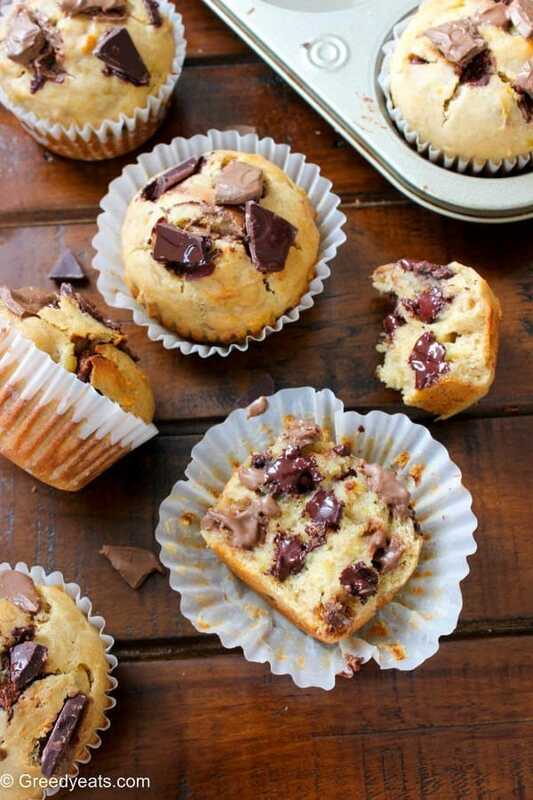 These muffins are almost fatless. And they are sure to stick if not greased. 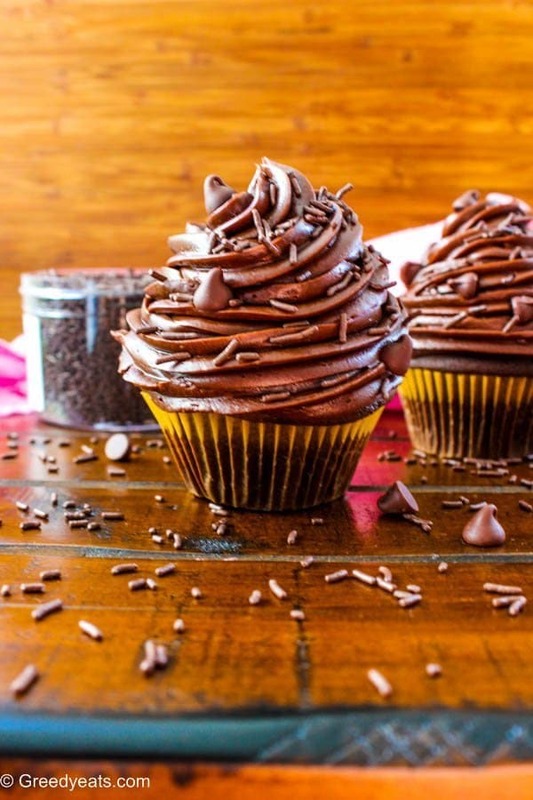 Hungry for more chocolate? Here you go! Thickest chocolate chip cookies ever! Follow me on Instagram and tag @greedyeatsblog so that I can see all the Greedyeats.com recipes you bake! 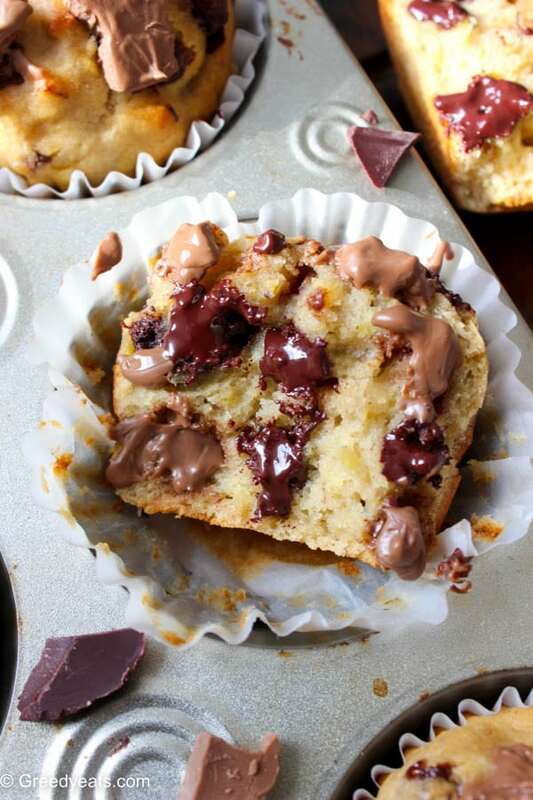 Tender, moist, super soft, fluffy and healthy banana muffin recipe for your guilt free snacking! 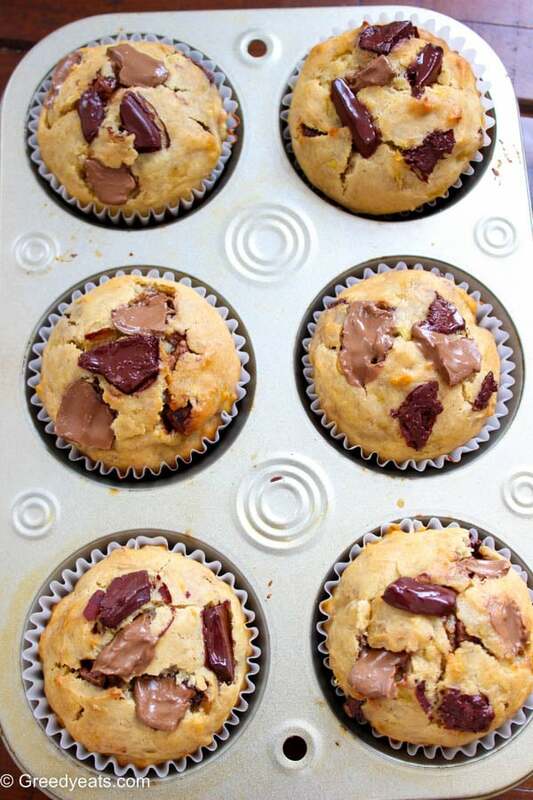 This is the best skinny banana muffin recipe that I have baked till date. 1. Firstly grease your muffin tin/liners (6 cavity) with a spray or some oil and set it aside. Now preheat your oven to 350 deg F.
2. 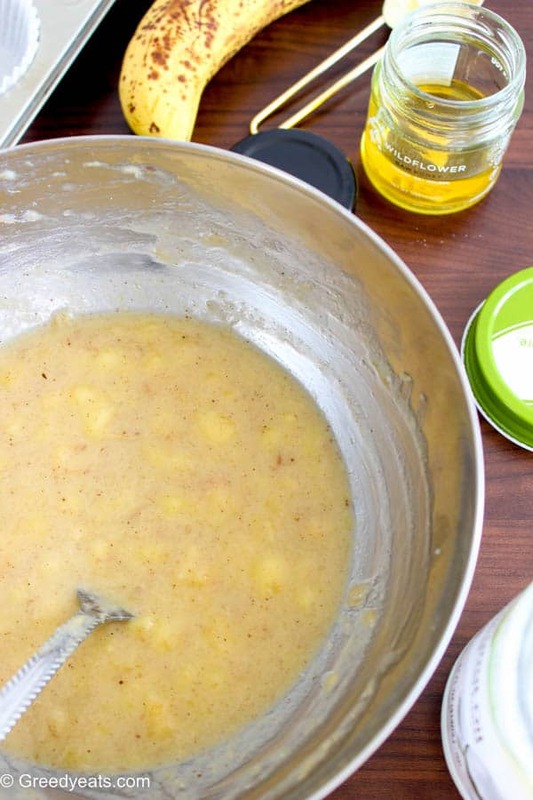 In a medium mixing bowl, add mashed banana, honey, oil, milk, Greek yogurt and egg. Combine it all well Everything room temperature please. 3. Sift your flour, baking soda and salt over wet ingredients and fold only till combined. 4. 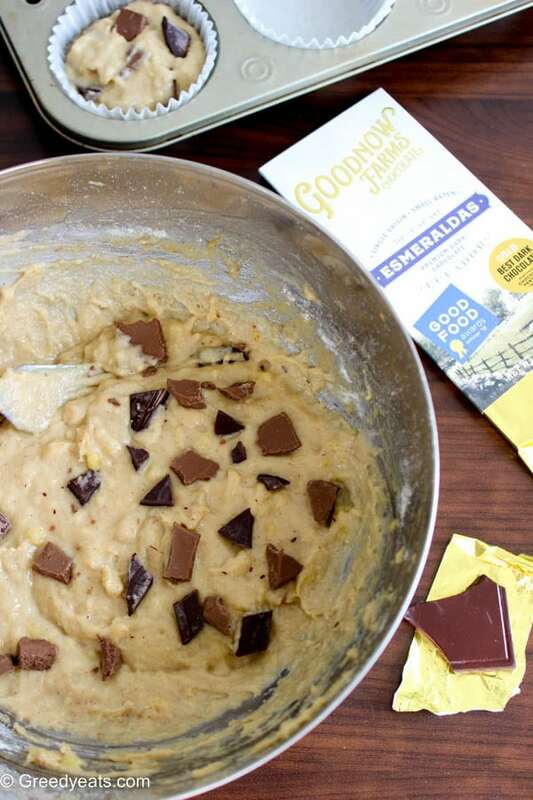 Now add in your chocolate chunks, saving some for topping on top. 5. Pour the batter into the prepared tin/liners and bake for about 20-25 minutes. Or until a toothpick inserted in the center of a muffin comes out clean. 6. Allow to cool for about 5-7 minutes in the pan and then let cool down on wire stand further. 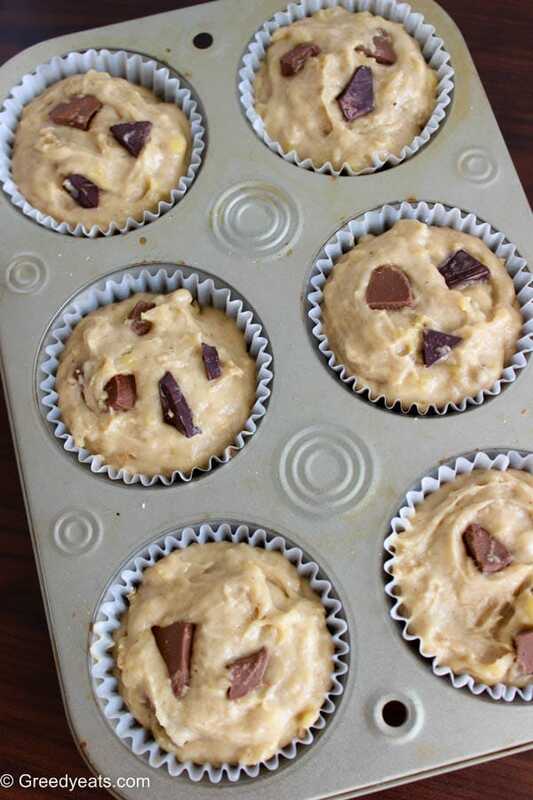 These banana muffins stay moist and fresh at room temperature for about 3 days. They keep well in fridge for up to 7 days. 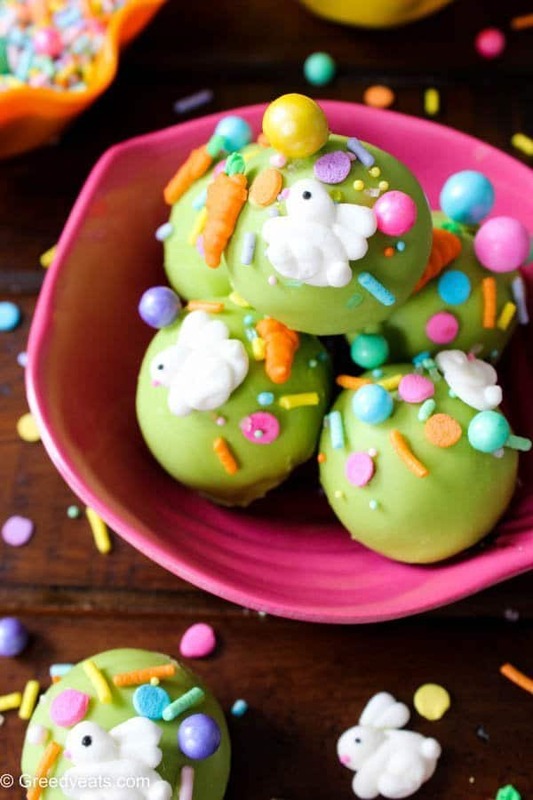 You can even freeze them for up to 2 months. 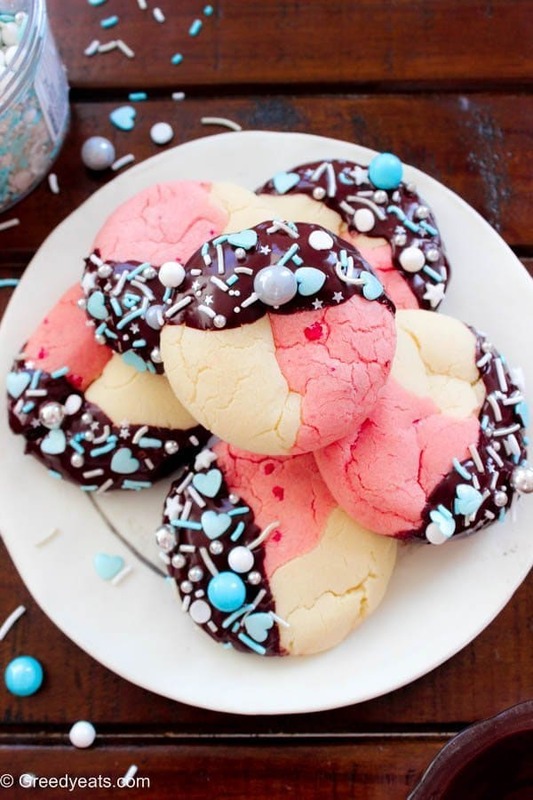 Thaw in microwave for 20-30 seconds before enjoying.